Moscow and St. Petersburg are the two gems of Russia. They are two of the most historically significant, culturally rich and truly Russian cities. Visit both these cities and see their iconic hallmarks on this tour. The tour will start at Moscow where you will visit the globally-recognized Moscow sites with a guide and translator. On the Moscow leg of the tour, you will see the famous Red Square. The square is home to some of the most famous Moscow buildings such as the picture-perfect St. Basil’s Cathedral and the Kremlin. You will also visit other scenic spots such as the Gorky Park, a glimpse of the Sparrow hills and a visit to the beautiful embankment. 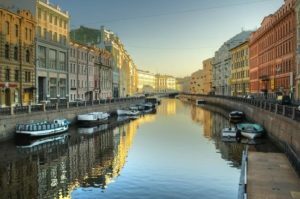 You will then travel to St. Petersburg via car or bus, depending on your personal preferences and the size of your group. Along the way, you will be able to explore a number of historical and cultural sites which are situated on the way. The journey will take about 10 hours and you will then spend the next two days at St. Petersburg. This winter jewel of Moscow is famous for its historical buildings and scenic beauty. Your guide will take you to see the famous Winter Palace of the Tsar, the stunning architecture of the Kazan Cathedral and the Vasilevsky Island situated at the edge of St. Petersburg. The Winter Palace along will consume many hours given that this palace is home to a breathtaking collection of artwork, including works by Rembrandt, Leonardo da Vinci and Michelangelo. The guide will also help you get to know the history of this city which has been at the center of some of the most important events of Russian history. You will also visit the Hermitage Museum which comprises of a number of famous St. Petersburg buildings. The city has a large number of canals and bridges, so you will essentially find a scenic, picture-perfect spot at every step and turn. This twin-city tour that will take you across the two majestic Russian cities will end in St. Petersburg. At the end of the tour, you will be dropped straight to the airport just in time for your flight. If you are planning your further travel through train, our guide and driver will drop you at the train station. Transportation options: by car, by van, by bus, by train.